So you’ve decided you need a CISA Certification. Chances are you’ve familiarized yourself with the CISA certification process with our article on the certification. But what’s next on the agenda? We’ve put together a list of tips for individuals who are working toward their CISA exam, including how best to deal with this quirky exam, dos and don’ts for success, and important points to keep in mind before taking the plunge! According to ISACA, there’s a huge skills gap in the market. The number of cybersecurity job openings far outnumbers the number of qualified candidates who can fill these roles. Why shouldn’t one of them be you? Companies need audit professionals that have IS audit, control, and security skills. The CISA certification proves that you have all the skills needed to take on an IS security role. Click here to enrol to our CISA Certification Training Course now! What Makes The CISA Exam So Difficult? As one of the toughest exams in the IT Security domain, the CISA exam is notorious for being difficult to pass as well as having a low pass rate. Although ISACA, the body that administers the exam, has stopped publishing information about pass rates in recent years, feedback from both successful and unsuccessful CISA candidates suggests the pass rate hovers in the 40 – 50% range. The CISA is a paper-based test. Unlike most vendor-specific professional certification exams, CISA’s conventional nature means candidates with little to no experience taking paper-based exams are caught out. There are no official educational requirements to be able to take the CISA exam, meaning casual candidates from a wide variety of backgrounds register for the exam, creating artificial competition. The questions on the CISA exam are often ambiguous and subjective, and many candidates complain sample questions offered by ISACA are vague and not relevant to the standards on the actual written exam. Emphasis on rote learning and memory. A common complaint is that questions on the CISA exam involve recollection of nomenclature and terminology from the IT Security syllabus. Why Is The Rate Of Failure Higher On The CISA Exam Compared To Other IS Certifications? Students with a technical or technological background often grapple with governance and auditing concepts. While technical know-how is important, the ability to audit and manage IT Security processes is a must for the CISA exam. At the other end of the spectrum, aspirants from audit and accounting backgrounds are excellent in these areas but struggle with the technical aspects of the exam. Students from such backgrounds would need to understand the concepts and core objectives of the curriculum. Many experienced students insist upon following their own approach to tackling difficult questions and scenarios on the CISA exam, eschewing the standard approach prescribed by ISACA. Here are 14 tips to keep in mind before commencing preparation for the CISA exam! ISACA offers the CISA Review Manual (CRM), a one-stop guide for the CISA exam. It is a comprehensive reference designed to prepare candidates for the CISA exam. It provides all the details related to the CISA exam, as well as defining the roles and responsibilities of an information systems auditor. Overall, this manual is the best self-study guide for CISA aspirants. Practicing review questions thoroughly is mandatory for this exam. ISACA’s Review Questions Database is a comprehensive online resource of practice questions, answers, and explanations. Members can get 12-month access to the database for $185; access costs $225 for non-members. Get it here. The nature of the exam calls for aspirants to think like an IT auditor or an accountant, not an exam-taker: because the emphasis is on real-world applications, sharpening your decision-making skills by tackling hypothetical problem scenarios and learning to manage, evaluate, and prioritize multiple tasks well will help you pass the CISA exam. In addition, Simplilearn has a variety of interesting, informative, and insightful resources on IT Security: dive right in to take advantage of our open library here! In addition to the CRM and CISA CDs, candidates should also visit other CISA blogs and articles available online to get better insights into CISA exam prep. Apart from sharing invaluable insights from the world of IT Security that may help aspirants tackle CISA questions from recently updated knowledge areas, blogs maintained by regular contributors are also platforms where news and updates about the CISA exam are likely to first break. ISACA’s Blogs: For information, tips, and tricks from the source! Risk3Sixty: Maintained by a couple of IT auditors with extensive experience, Risk3Sixty is aimed at professionals working in the IT Security Auditing space. The blog covers several day-to-day issues and challenges you can expect to face as a certified CISA auditor and will help you settle into the auditing mindset. You’ll make the CISA certification experience simpler by gaining practical, hands-on work experience in IT Security. Although similar to financial and resource audits, IT audits have a very different scope, dealing primarily with information. CISA aspirants should have a fair idea of business processes, audit scope definition, audit planning, and reporting. Even a little exposure to IT Security processes can help: where and when possible, seek out IT auditing professionals or the IT Security department at your current organization to familiarize yourself with the roles, responsibilities, and daily activities of CISA and other Security positions. Managing study hours and allocation of time by subject areas is essential to be successful when you take the CISA exam. If you are a working professional, planning for the examination 3 – 4 months before the examination is our recommendation. We also suggest that you dedicate at least an hour or two of study on a regular basis. According to CISA exam prep coaches, spending 35 – 45% of your time on the manual, 15 – 20% on coaching, and another 35 – 40% on simulation exams and practice tests is the recommended way to spend your study time. In the context of the CISA, one of the best pieces of advice for anyone to take away would be this: unlearning what has been learned is almost as important as learning fresh content. The IT industry is dynamic and ever-changing and, consequently, so are its auditing principles and techniques. As with many competitive exams, success on the CISA is also a function of how well and efficiently you manage the test itself: a common theme among unsuccessful aspirants is a lack of time to complete the exam, which results from mismanaging the question paper. By reviewing the previous years’ question papers and mock test questions, you should devise a plan of attack with estimates of the amount of time you want to expend question and subject area so answer as many questions as possible—after all, a successful CISA is expected to think on their feet and be able to make take quick, effective decisions: managing the CISA paper to maximize your score might be a smart first step in your journey! Participants can join CISA groups and forums to interact with other CISA aspirants and past CISA participants. These platforms can provide both theoretical and practical knowledge on IS auditing and help improve the candidate’s grasp of the concepts and their real-world application. At Simplilearn, we host a lively discussion forum of our own where industry experts, CISA professionals, and aspirants meet to engage in constructive debate and knowledge sharing. Come join the discussion here! Although a portion of the CISA syllabus calls for rote memorization, acquiring a degree of proficiency and fluency with IT Security means gaining a thorough understanding of the exam’s various subject matter areas. Presented in an easy-to-assimilate, storyboard format, ISACA’s training material is available on CD from the ISACA online store. We recommend that candidates also look to acquire previous years’ CISA CDs, as well as the mock-exam generator that is shipped with CDs. Many accredited organizations offer CISA certification training courses online and in-person. Enrollment and participation in a well-structured and comprehensive training course is highly recommended. 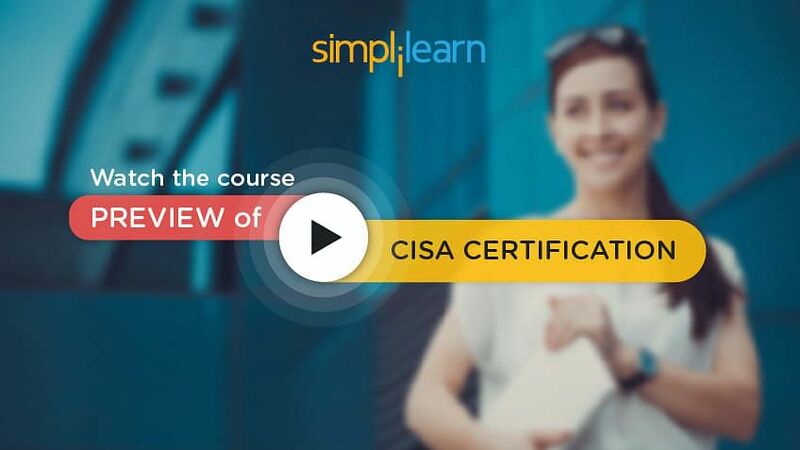 As the world’s leading professional certification training provider, Simplilearn has a network is a leading training organization that offers CISA certification training via a unique blended model approach that includes CISA classroom and CISA online training courses. It also recommended that you download and review ISACA’s CISA Glossary Of Terms to become familiar with IT Security technical terms in English as well as acronyms applicable to the CISA exam. Although it’s a difficult exam, with proper planning, hard work, and the right guidance, passing the CISA exam on your first try is far from impossible. Follow these tips and make a solid study plan that works for you. One more thing–once you’ve received your CISA certification, don’t forget to let us know: we might want to feature your success story on this blog!